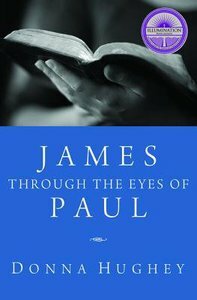 James through the Eyes of Paul is a Bible study that guides readers in examining the book of James in light of Paul's teachings on faith, perseverance, and submission. James and Paul describe complementary parts of a believer's relationship with God, and together they shed light on every Christian's responsibilities to fellow believers, to nonbelievers, and to God. Studying only one of these men's teachings can only give you part of the story--but studying them together provides a complete and honest view into the Christian walk. Each chapter is presented in a clear question-and-answer format to help Christians better understand the biblical truths behind their faith. Suitable for individuals as well as Bible study groups, James through the Eyes of Paul is an advanced study for the everyday believer. ""Donna Hughey has once again given us a tremendous Bible study companion, this time on the book of James. Donna does an effective and thorough job of weaving the practical advice of James with Paul's constant emphasis on salvation through faith; bringing both New Testament authors together through Scripture. This study is sure to strengthen your faith and witness as we strive to live as Christians in today's world."" --Randy Paredes, Senior Pastor, Florence Christian Church, Florence, OR ""Insightful and engaging! This study challenged me to grow deeper in my faith. It's an effective, must-read resource for spiritual development."" --Dan Clemens, Lead Pastor, Discovery Christian Church, Moreno Valley, CA Donna Hughey has written numerous Bible study workbooks, including The Apostles' Creed: An Advanced Study for the Everyday Believer and Wisdom Beyond Measure: The Sermon on the Mount. She is also the author of The Preacher, a novel. About "James Through the Eyes of Paul"
Donna Hughey has written numerous Bible study workbooks, including The Apostles' Creed: An Advanced Study for the Everyday Believer and Wisdom Beyond Measure: The Sermon on the Mount. She is also the author of The Preacher, a novel.